After the year started off very stressful, with a mid-term review at work and the weeks leading up to preparing for it. Our team had nailed the presentations and this lead to some followup things. A meeting with my former working place at BMW Research and Technology, was scheduled on a short notice in March. Therefore, I took the chance to meet up with some former colleagues. Apart from the working meetings, I took the chance to also have a meet and greet with my best friend Gesine and one more of the fancy fives, Laura. The weather turned from heavy snow to rain and blazing sunshine in March. Luckily, the snow and rain stopped after the working obligations were over and we could enjoy the biergartens and city with sunshine or at least no rain. After having been in Asia for quite some time at this point, the good old german breakfast with Wurst, Käse und Marmelade was part of the daily routine. 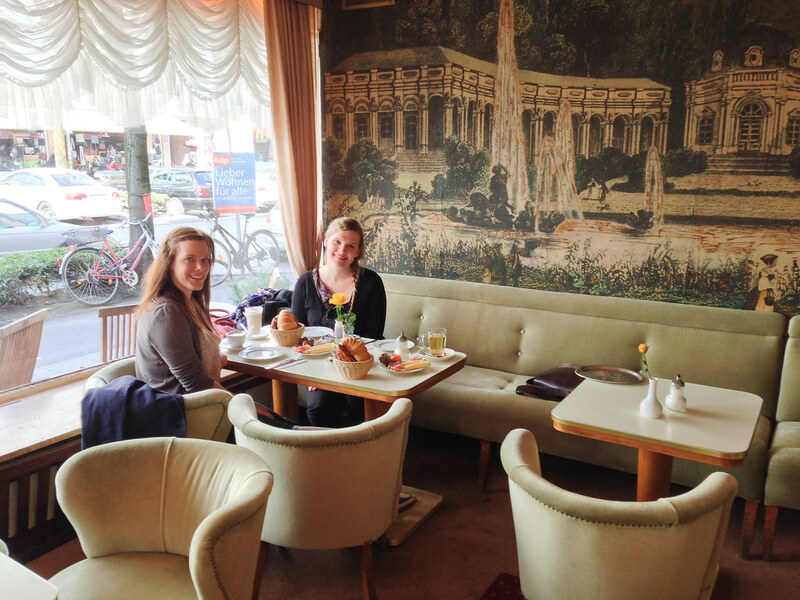 Not always did Gesine and I eat at such fancy breakfast places as the Cafe Jasmin, but the meals at Motel One at Ostbahnhof or Deutsches Museum were also okay. Even though a proper German breakfast is great, being in Bavaria a “Weißwurstfrühstück” had to happen at least once. Gesine never had it before. 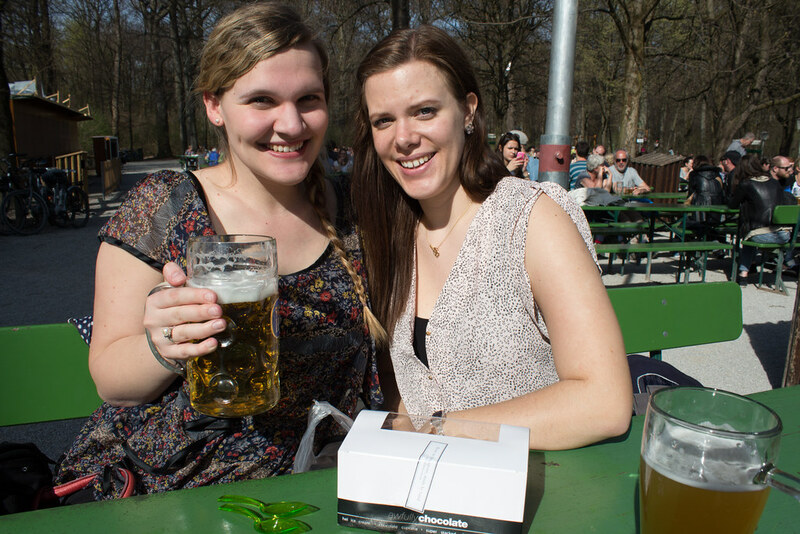 When being in Munich, I like to bring people to a small and cozy place at Munich’s Isartor. Coincidentally the place was called Gasthaus am IsarThor. There it doesn’t feel like a tourist trap as the ones at Viktualienmarkt and every once in a while a proper bavarian in full traditional clothing, leather-hosen or Dirndl, comes in and has a drink - Beer of course. 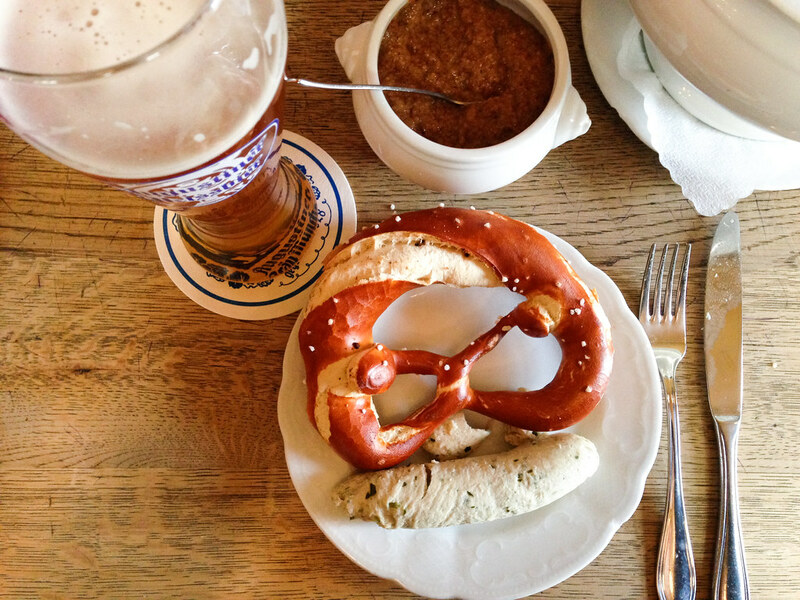 The proper Weißwurstfrühstück has to be had before noon and consists of 4 ingredients - Wheat beer, Brez’n, Weißwurst and sweet mustard. 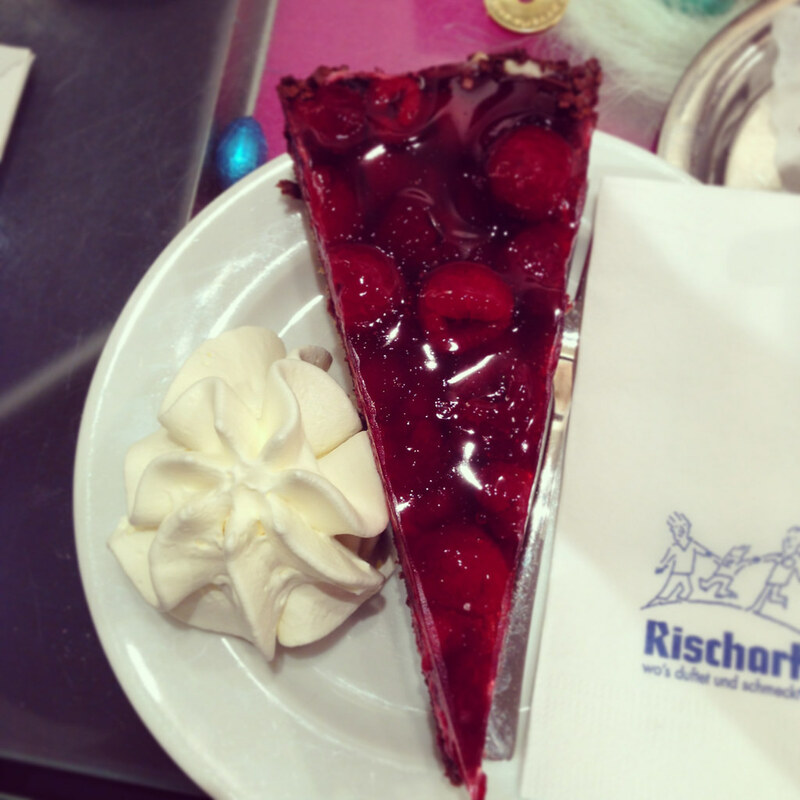 Lunch, we mostly skipped but therefore added a even more indulging Kaffe und Kuchen, very touristy at Rischart. Having lived in Munich for a little over a year before moving to Singapore, I acted as a short tour guide. 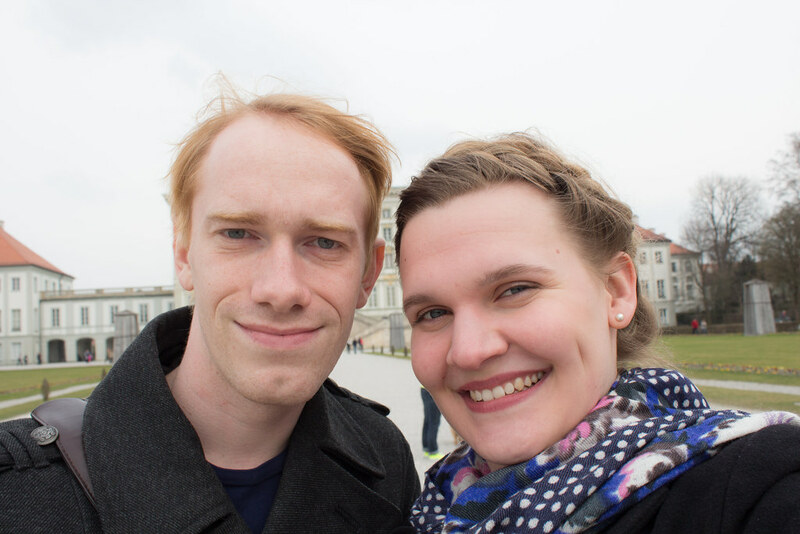 Gesine and I visited the Deutsches Museum, wandered through the Hofgarten and Residenz, and explored the area round Marienplatz. In addition we visited the Pinakothek der Moderne together and Gesine the Neue Pinakothek with Laura. This relieved us from our educational duties and on one evening we watched the just released Grand Budapest Hotel motion pictures in the Museum Lichtspiele, where The Rocky Horror Picture Show is shown continuously since 1977. Last on my agenda through the city was a visit to the Schloss Nymphenburg, the city castle and summer residence of the House of Wittelsbach. Even though I have been many times to the park, I actually never visited the inside of the castle itself. We took a tour now. It was nice to see in what kind of pageantry the rulers were living and that money was not an option. Whenever I am around with Gesine, we find some Squirrels somewhere, this time was no different. 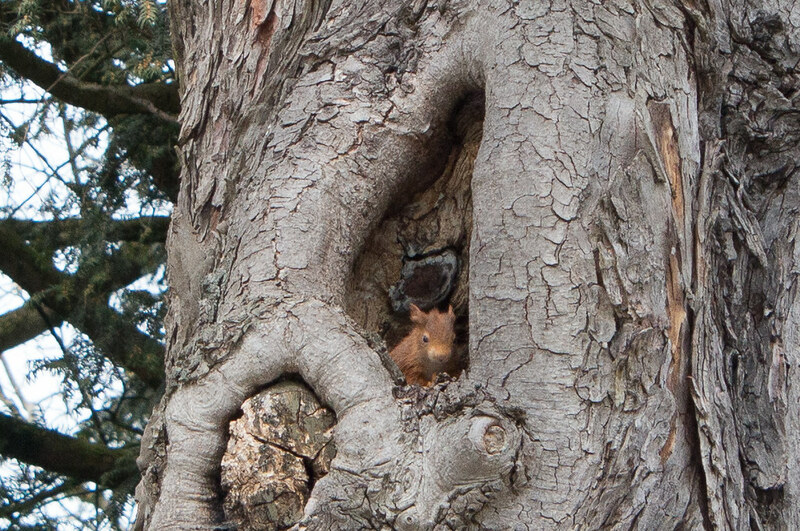 We were sitting in the park of Schloss Nymphenburg enjoying a YES-Törtchen and there it was in a tree next to us. Laura had been in Singapore in 2013 and we booth liked the treats from awefully Chocolate. Additionally, we have told Gesine how great it is. My gift to Gesine and Laura was, since I was the only one from Singapore, to bring some cakes. This wasn’t an easy endeavour. I bought the pieces of very melty chocolate cake on the day of the flight and carried it in carry-on luggage from Singapore via Dubai to Munich. Surprisingly, it still looked fine. The taste, wouldn’t have been compromised anyway. The video(~100Mb) shows the opening of the original packaging with the seal in the English garden at the Chinese tower. Even though the carbon footprint was not optimal, the taste was. The days in Munich were over, and even tough we extended our stay by another day, due to work related obligations, we had to leave. The monopoly for the German railroad company Deutsche Bahn of long distance earth bound travel was broken just recently. This opened up the opportunities for long distance bus routes. These were popping up like bubble-tea shops and the prices were in free fall. We took the chance and even tough the trip was a little longer the 12% of the price of the rail ticket was worth it. In the bus they have comfortable seats and even some spotty wifi. 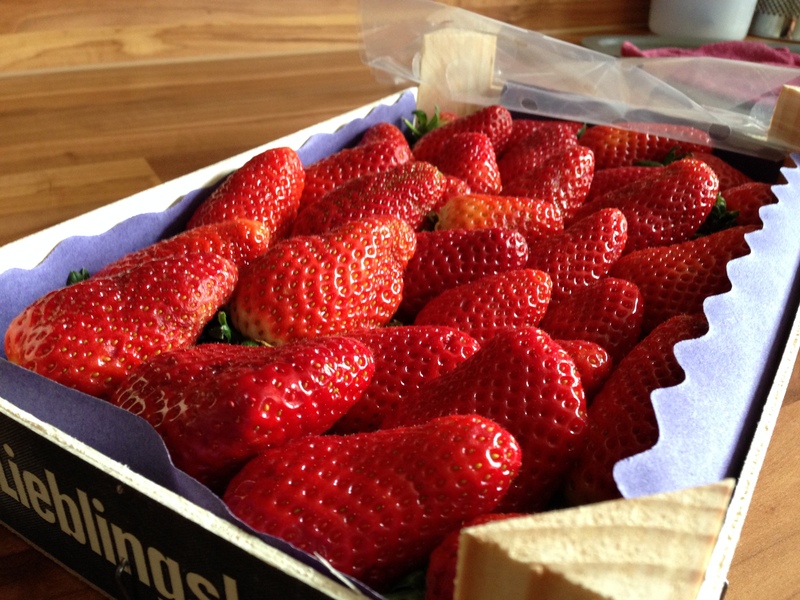 At home I indulged me even more with some nice early strawberries. More pictures are available in the flickr album.